After we spent the holidays on our free trip to Steamboat, I was hooked on a new hobby, finding ways to travel for free. Many of us are familiar with earning points and redeeming them for free nights using hotel rewards programs. Then I stumbled on a fascinating way to pick up free rooms without rewards: the best rate guarantee! Many of the hotel chains offer a best rate guarantee (BRG) program that rewards you with a free or discounted room if you find a lower rate on another website after you book your room (usually within 24 hours or so). Each hotel chain has their own specific rules, but in general, the hotel, date, number of people, type of room, and cancellation policy must be an exact match. I just successfully booked free rooms in Chicago for an upcoming Saturday night. I also booked free nights for our upcoming Spring Break trip. Because you can book multiple rooms on a night, I got a free room not only for us, but for the family that we are travelling with too! 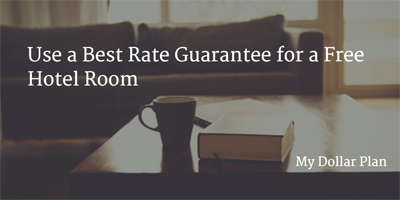 Book a hotel room with a chain that offers a best rate guarantee. Search for a lower rate. Get your room for free! I have located lower rates using Hotels Combined, Kayak, and Tripadvisor. Once you see a lower rate, use the actual site that the shows the lower rate to submit a claim. The claims will get denied if you use the aggregator sites. My successful BRG claims were submitted based on rates on easytobook.com, Hotels.com and Priceline. BRG Deals Blog. I even stumbled onto the BRG Deals Blog. The site is dedicated to finding BRG deals. David lists multiple hotels daily that have a price discrepancy that you can book a BRG deal on. That’s how we scored the free night in Chicago. Hotels BRG policies. IHG and Choice hotels give you a free night; Starwood and Club Carlson match the price and give you an additional discount. For other hotel chains, Travel is Free keeps a list of Hotel Best Rate Guarantees. Resubmit. For our spring break trip, I was denied the first couple times I submitted the claim since the room price kept fluctuating. I resubmitted the claim the next morning and was approved! Look at various types of rooms. Look beyond the lowest price room. I found that many of the lowest price rooms match in price, but there might be a certain room type that doesn’t match. Our upcoming free rooms for spring break are based on the most expensive suites, not because we needed them, but because they were the rooms that had a price difference. Normally, I wouldn’t have even looked at the suites, so it pays to keep your eyes open. Don’t book the last room. One of the mistakes I made was to take the last room of a certain type. When I submitted my claim, the room type no longer showed as available on the competitor site. Don’t book the last room if you want to submit a claim. Keep track. After booking multiple rooms, I had to remember to cancel the rooms we weren’t going to use! Stay organized and don’t forget to cancel any you don’t need. I use AwardWallet to keep track of all of our travel plans. Have you used a best rate guarantee to get a free hotel room?